- Only Manticore and/or Apocalypse equipment sets are eligible for this event. - To be eligible for the reward of Objective #1, players must have a minimum of 5 different set pieces from either purely the Manticore Set or purely the Apocalypse set that are each enhanced to at least +6. Mixtures of set pieces between Manticore and Apocalypse equipment to fill the minimum requirement will not be considered. 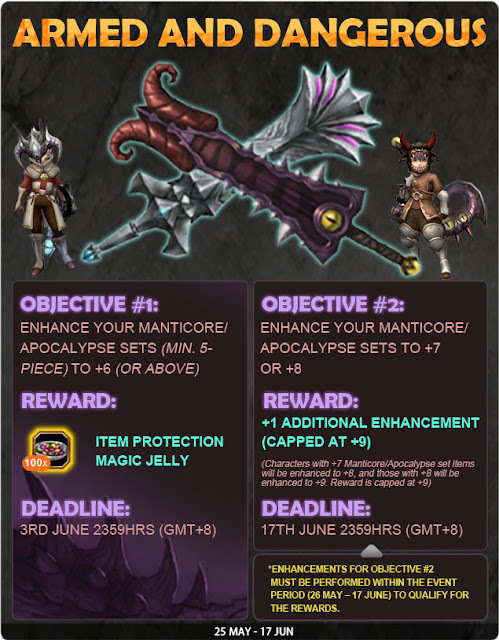 - Players who meet the requirements for Objective #1 by the cutoff period of 3June 2012, 2359HRS (GMT+8) will be eligible for the reward of 100x [Item Protection Magic Jelly], regardless of the date it was enhanced before that period. - The reward for Objective #1 is limited to 100x [Item Protection Magic Jelly] per character. 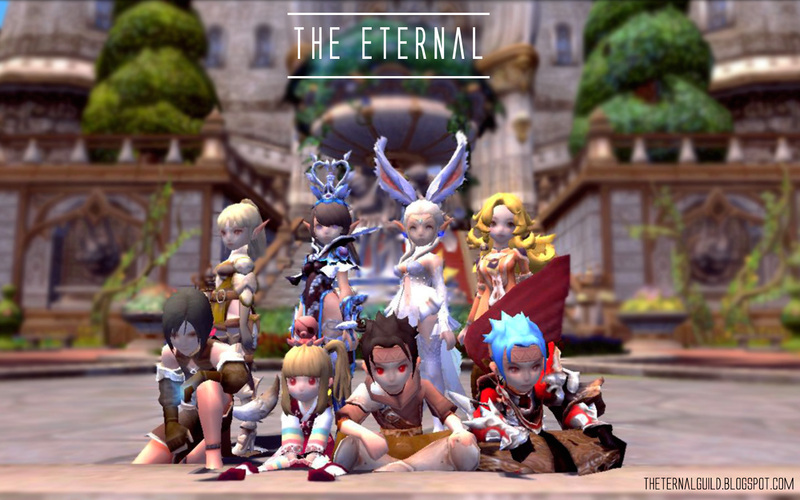 - To be eligible for the reward of Objective #2, players must enhance the set equipment during the event period of 25 May 2012, 0000HRS (GMT+8) to 17 June 2012, 2359HRS (GMT+8). Equipment that had already been enhanced to +7 or +8 beforehand will not be eligible by default, unless it is enhanced again during the event period. (Eg; previously enhanced +7 equipment that is enhanced to +8 within the event period will be eligible for the reward, causing it to be +9 after crediting). - There is no minimum set piece requirement for Objective #2. Single Manticore/Apocalypse set pieces that are enhanced to +7 or +8 are eligible (as long as they meet all other requirements as above). - The rewards for Objective #1 will be credited to all eligible players on 4 June 2012, before 2359HRS (GMT+8), while the rewards for Objective #2 will be credited on 19 June 2012, before 2359HRS (GMT+8). - These terms and conditions may be changed at any time without prior notice. Any changes made will be reflected accordingly.